Today was George Washington day. We began the day reviewing what we talked about on Tuesday. I hate to "pat myself on the back," but those little ones remembered Abraham Lincoln, that he was a president, that he is on a penny, and a $5.00 bill. I was impressed. I brought out a 1 dollar bill today to introduce George Washington. We talk ed about George Washington being the first president and being on $1.00. 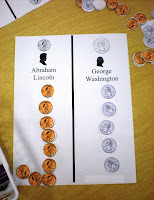 I then gave each of the children a quarter to take a look at Washington there. Unfortunately, my finances don't allow each one to take a quarter home like the penny. 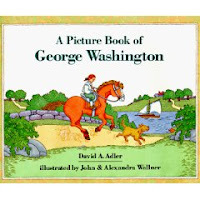 I had my book on George Washington, "A Picture Book of George Washington," by David A. Adler, Illustrated by John & Alexandra Wallner. Again, we looked at and discussed the pictures. At this time I introduced a table game I would have out for them. It was a sorting and matching type game. 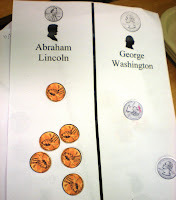 I had printed out some pennies and quarters, I then made a sheet with a picture of a penny, Lincoln, and his name on one side, and a quarter, Washington, and his name on the other side. 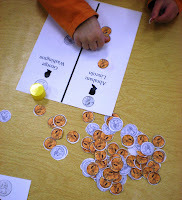 The pennies and quarters were spread all over the table, intermixed. 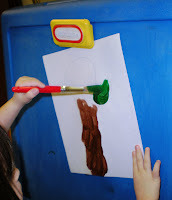 The children were to pick up a coin and decide which side of the paper to glue it to. We did one paper together at circle time. During free time they were able to play this if they liked. 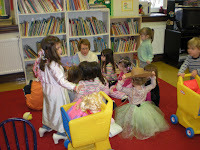 Again, about half the class took part in the activity. It did need a little more guidance than the color fun paper. I think because I had run off the gluing paper so the coins were black and white instead of brown and silver like the printed out coins. Next year, I will print enough out from my computer. 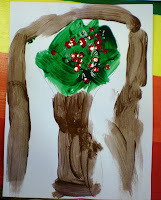 We had discussed George and his cherry tree at opening time so our craft today was a cherry tree. 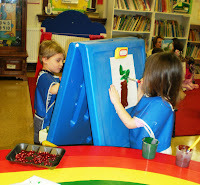 Today's craft incorporated easel painting which is great for muscle development in young children. 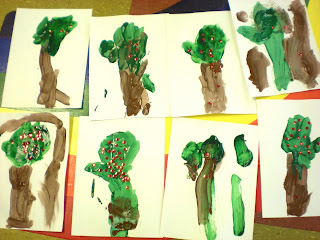 It also had fine motor advantages as they had to pick up sequins and place them on their cherry tree. 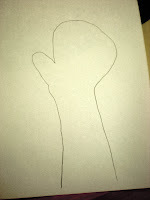 To do the craft trace each child's forearm and open hand. This is going to be the tree. 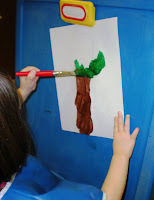 Place the paper on an easel and allow them to use the paint on the tree. 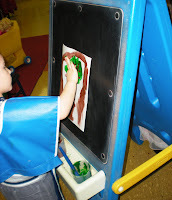 After it is all painted let them add the sequins to the wet paint. No glue needed, they will hold as the paint dries. (I hope). UPDATE: I went into school today, and most of the sequins fell off. I learned a little secret. 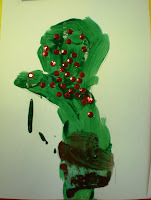 My Pre-K teacher was there and she told me to mix some glue in the paint next year and the sequins will stay. You learn something new everyday! We finished up the day with Mat Man. 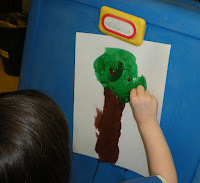 The children really enjoy creating him. 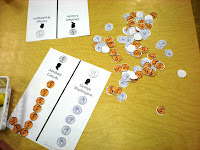 Cute sorting game with Abe and Washington!